Here are our proud young does. Some of them traveled half of the country to us. They have correct dairy traits and wonderful genes behind them. AND most of them are organic babies born and raised here at our farm! Judge would like Sheba to be more mature in the next 2 years. However, kidded single buckling, she has amazing capacity and butterfat in our DHI program (2.9 lb 7.2%). She kidded one buck as FF, yet is producing 3 lb of milk per day. Rhada is a beautiful small doe; as FF, she kidded 2 bucklings. A dream to milk and is producing 4 lb per day. Rhada just received SUPERIOR GENERIC award from ADGA in dec. 2015. We did not do a good job while we tattooed our kids. Was afraid of hurting their little ears. In results, there are a few kids were not able to be recognized during our first LA. Heema was given a verbal LA by Judge. He believe she could get a 83 as a FF. Heema has a amazing capacity, and beautiful udder. She gives 4 lb. 4.7% butterfat with 2 kids on the ground. Heema is beautiful and complex. 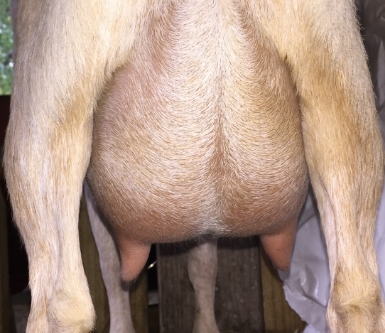 Her udder is so beautiful and wonderful to milk. Check out her bloodline with all the toppest herd and toppest goats in those herds in her. A dairy dream for our little organic farm. She produces up to 4.1 lb per day, kidded one doeling and one buckling. More Junior Does to come.